Various Artists - "Composition 3: Volume One"
Composition 3 is a score, or set of instructions really, by Charles Rice Goff II, intended for four performers each simultaneously performing one of four parts, or for solo performer with the aid of a multi-track recorder. Participants execute the piece by following a detailed set of instructions which requires a pair of dice, a small bowl, a small rag, a deck of cards, three non-percussion musical instruments, two portable radios and six hand held non-instruments. I'm struggling to concisely summarize all this so I'd encourage readers to CLICK HERE to see Charles' instructions. It's very interesting. In any event, the instructions are organized such that no two executions of Composition 3 will sound the same. There are seven entries on Volume One, and sure enough each is indistinguishable from the other and of varying lengths, the most obvious common denominator among them being the recitation of a series of short lines Charles composed. (I had to chuckle to myself when hearing "Did Tolstoy want to be Tolstoy when he was twenty-five?" brought the comfort of familiarity.) Among the participants is Composition 3 composer Charles Rice Goff III, long time Goff collaborators Mikadams, Eric Matchett and Hal McGee, Greg Segal, Marcel Herms (aka Fever Spoor), and Pascal Hament. Mikadams' execution features a hypnotic droning sitar that winds it's way throughout the piece, adding a hauntingly strange Indian vibe. Along with the basic theme is Charles' lines and other strange spoken word bits and an interesting melting pot of noise, sounds and field recordings, which sounds very cool against the backdrop drones. Hearing Charles' written lines recited throughout the entries kept reminding me of Captain Beefheart, with such examples as "I always order the infinite paradox with jelly icing" continually bringing to mind the old Trout Mask Replica "a squid eating doe in a polyethylene bag is fast and bulbous... got that?" type phrases. Fun stuff without having to get overly concerned about its meaning. Greg Segal's execution is more sparse, with the spoken word being at the forefront, along with a mellow recorder melody, light percussives, guitar, and the chance radio bits that Charles' instructions include. In fact, these randomly found radio stations provide one of the most common yet varying denominators across the entries and makes for some interesting and often fun variety. Dutch sound artist Marcel Herms concocts an interesting brew by bringing together church organ and other keyboard lines, spoken word, radio, assorted sounds and even Neil Young. C. Goff III's execution of his composition is another that is dominated by spoken word, though in this case that also includes song (love those lyrics Charles!). Of course we also have miscellaneous sounds and radio, along with guitar and percussive clatter, but these are embellishments for Charles' spoken and sung delivery, often with an amusingly theatrical feel, which are what kept me intrigued throughout its 11 minute length. I could easily close my eyes and picture him on stage in solo performance. Pascal Hamet is new to me and a Google search of his name returned a single hit - a review he wrote of an early C. Rice Goff III CD. Anyway, Pascal offers one of the most intense executions of Composition 3, creating a dense wall of sound that soon transitions to a strange spacey bit. At just under 4 minutes this is the shortest piece of the set and I was disappointed that it wasn't fleshed out further. Eric Matchett is yet another participant who focuses on spoken word, with the sounds and instrumentation being sparse but integral to the whole. I liked the resulting combination and though it was another short track I thought it worked well. Volume One concludes with veteran sound artist Hal McGee. What's interesting is at this point I'm starting to recognize even more commonalities across the pieces. Each is completely distinct from the other, but I can sense the structure laid out in Charles' instructions. The overall ambience of Hal's entry is a trademark sound from his own works, but within that is spoken word, piano, noise and clatter percussion. A close reading of Charles' instructions is necessary to understand the overall goal, though by no means required to enjoy the entries from a general experimental sound art perspective. However, I'll confess it took me a few close reads to understand the instructions and now that I've wrapped my understanding around it I think there's lots of potential for a fascinating live performance. In the meantime, I'll look forward to Volume Two. 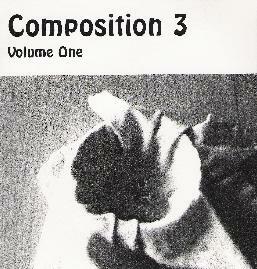 Read the full "score" of Composition 3 at: http://www.geocities.com/padukem/Composition3.html. Contact via snail mail c/o C. Goff III; PO Box 146; Lawrence, KS 66044.